There is no end point for creativity in design. Every day, top-notch designers create new design concepts to make difference. To make the life easier and to bring a fresh experience for our users. 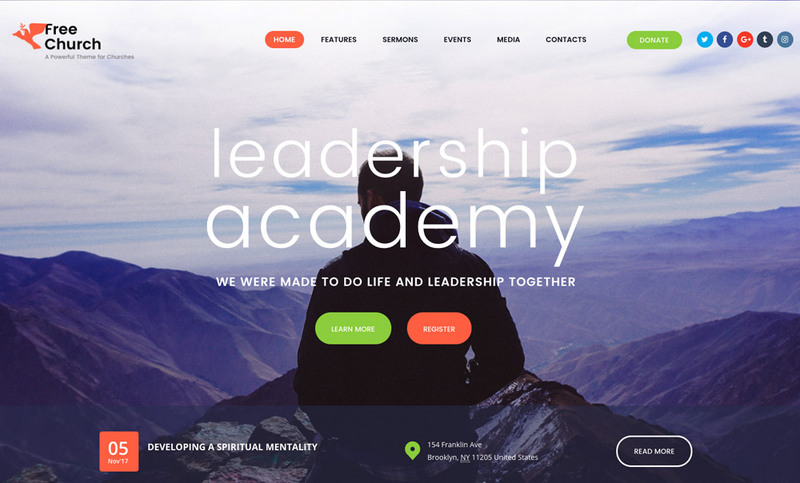 In search of quality designs, today we’re featuring 7 stunning church WordPress themes. We have tried to focus only on new designs and of course the best of them. Although, We don’t forget the functionality nor sacrifice design to functionality. For a church WordPress theme or any related websites such as fundraising projects, non-profit organizations and other religious websites, there are a few features that should be considered when you choose a WordPress theme. In addition to the design quality and responsiveness, having options for donations, events, sermons, and communication with visitors is a must. Here are our picks for you, a short list of 7 new stunning Church WordPress themes released in 2017. 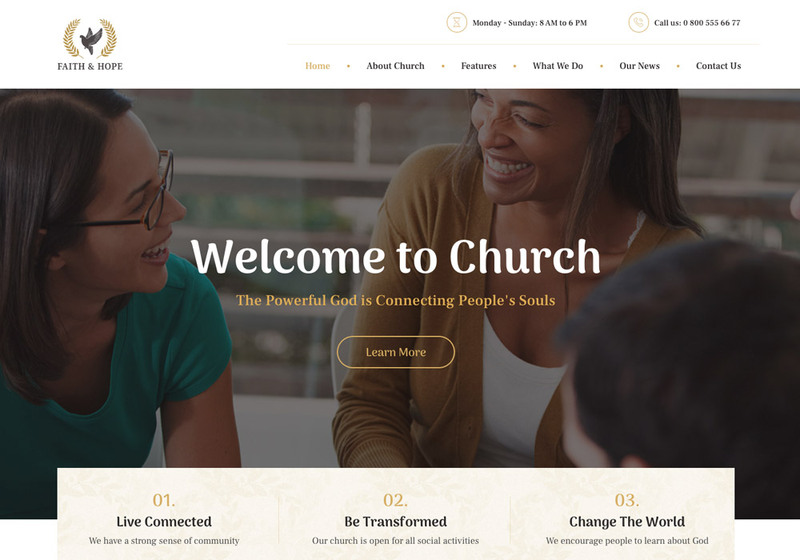 Say Hi to Holy Church; a WordPress theme that has been created for building websites for churches, prayer groups, and charity organizations. It offers all the functionalities you expect from such themes in a one-stop solution. Holy Church is a design-driven theme with a high focus on minimalistic design and typography which brings your content to front and center as well as the photos which will get importance in this type of designs. I personally like the design maybe because I’m a fan of minimalistic designs and such nice typography. The homepage comes in three variations. Each of them has a unique navigation menu and a unique feel which allows you to personalize your theme. Also, the amazing use of main/accent color in this theme lets you change the overall design look by playing with different colors. It’s obvious that extensive design effort is behind the scene of Holy Church. If you like the design (like me! ), don’t worry about the functionality, it offers all you might need. Holy Word is a WordPress theme created for churches, prayer groups, charity and non-profit organization. It’s compatible with Event Calendar plugin which brings a necessary feature for these type of organizations. You can easily show upcoming events on your charity site and increase your attendants. The theme is a basic clutter-free convenient solution for small church or charity websites. 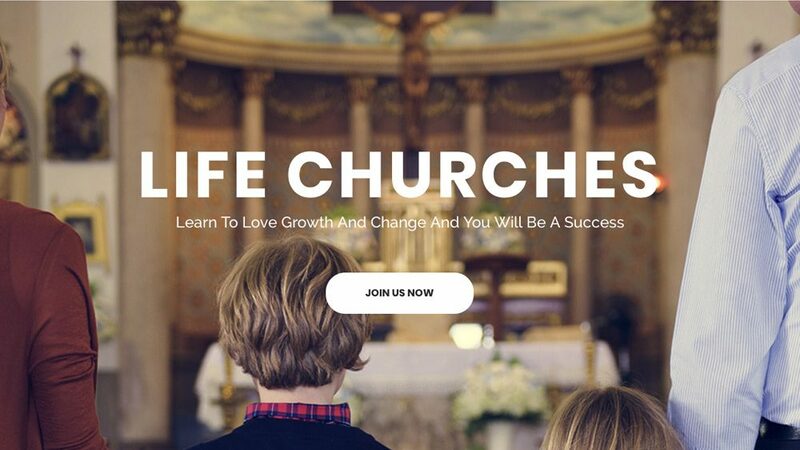 Life Churches is clean, modern, feature-rich yet easy to use Church WordPress theme which offers essential features that a church website might need. It’s best suited for religious organizations, church events, and donations. It provides a simplified user-friendly support of video/audio files for sermons to reach out and touch your visitor’s heart. Life Churches also supports your events allowing you to create and display your upcoming events of your church which is a vital feature for a church website. If you run some religious projects and need people contribution, you can collect funds effortlessly using the WooCommerce support. Life Churches is based on the best-selling WordPress page builder plugin Visual Composer and by purchasing this them you will get a free copy of this plugin which you should normally pay around $34 to use it. Also for the outstanding introduction slideshows and animation, it benefits from another premium plugin which is Slider Revolution, and thankfully it’s bundled for free too. Finally, you can build your church website in any language you like as it is translation ready and even run a multi-lingual site because it’s compatible with the leading WPML plugin. 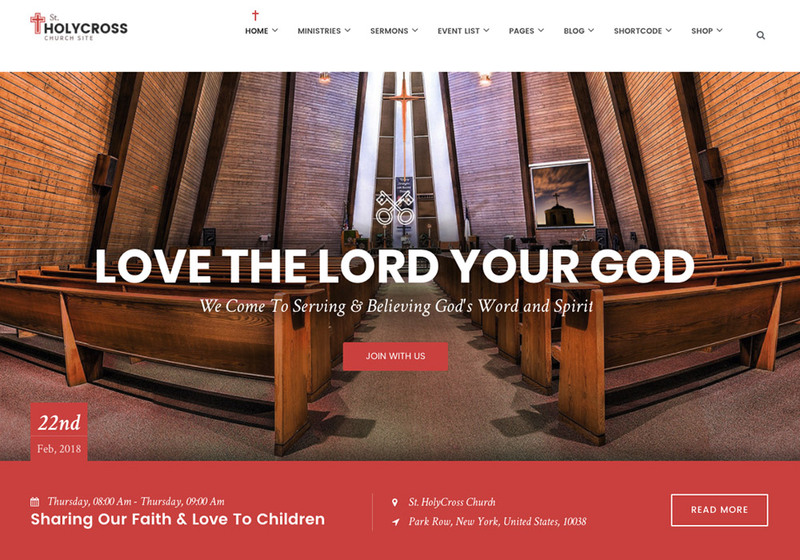 HolyCross is another exclusively built WordPress theme for Church-related websites. It allows you to communicate with your visitors in an efficient and modern way. The convenient features are your helpful toolkit to build the most important aspects of your church website such as donation page, sermons, and events. Various homepages, multiple blog layouts, header options, custom-crafted shortcodes, and much more features are in your hand if you use Holycross. If you take a look at the demo, a nice upcoming event widget will catch your eyes. Also, the icons used to make more feel of the church on the navigation menu. A call-to-action section is thoughtfully located under the slider for the events, and finally a dedicated page section for the donations. In term of technical stuff, it’s a new standard responsive theme which is optimized for search engines too. 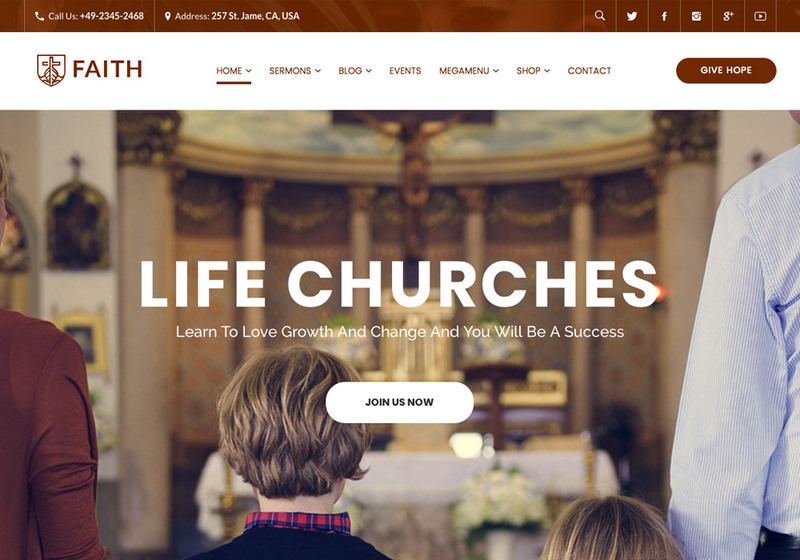 Faith & Hope is warm, graphically clean and clutter-free church WordPress theme which has been created for Christian groups, charity, and non-profit organizations. The theme can be considered as a ready to go solution for your church or charity website. It includes a comprehensive demo website which almost covers all you might need. And the good news is that you can import the demo easily in a few minutes and get your website running right away. With the help of Visual Composer, you only need to drag and drop different blocks into the page to build new templates. Or you can edit the demo pages once you imported them. You won’t need any technical skills to work with the page builder. It’s a user-friendly yet powerful tool that used by hundreds of thousands of websites. 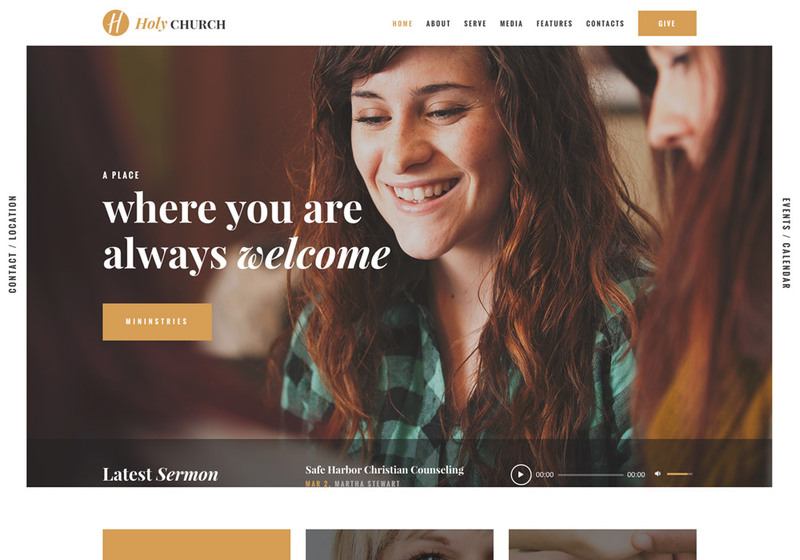 Free Church could be a great choice for your church or charity if you’re after a modern look for your website. It includes 3 unique homepage layouts and a number of features that a church website will need. Features like event management, sermons, donations page, video/audio support, blog, and forms. If you check the sermons page, one functional feature that the theme offers is the video, audio and pdf support for each sermon. The theme uses ThemeREX donations plugins which is a perfect choice for fundraising and charity. Also, WooCommerce is supported as well to sell Christian literature, fits, apparel and other goods. And finally, as always, you can import the demo easily with just one click. 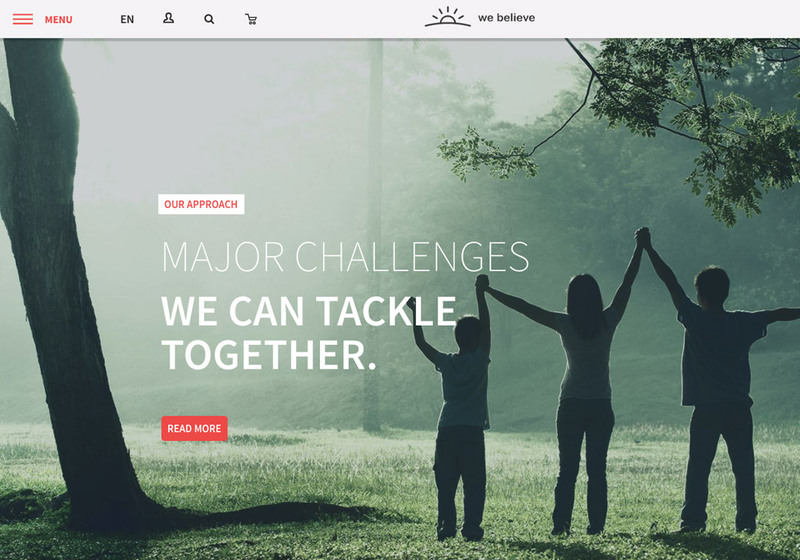 WeBelieve is a multi-purpose WordPress theme designed for charity, churches and fundraising websites. The design is clean, full of fantastic icons, minimal with a focus on usability and user experience. The typography is done very well. There are multiple homepage layouts at your disposal. from creative variations which mix different elements to purpose-built ones such as fundraising, sermon and event landing page. WeBelieve comes with a powerful and customizable sermon manager which supports multiple data types such as self-hosted videos, external youtube/Vimeo videos, audio files and pdf files. With WeBelive, it is easy to make a donation. You can accept donations via the custom-crafted forms with online payment integration. 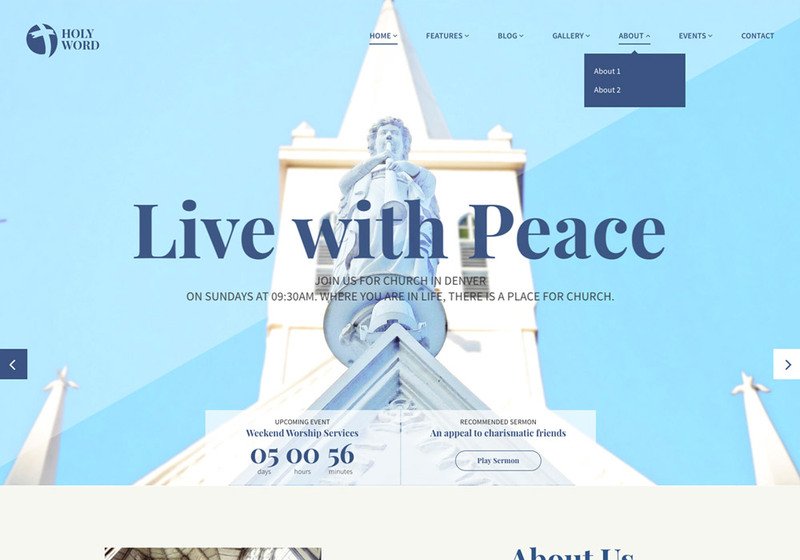 There are a couple of other cool features such as church ministry management, unique headers, multi-language support, newsletter integration and WooCommerce support all available to you by choosing this elegant church WordPress theme. If you know any other great church WordPress themes that should be listed here, don’t hesitate to contact us.